Hunt ‘responsible for bugging chambers’. 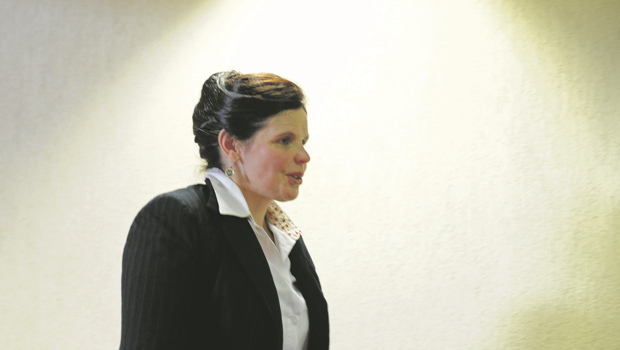 KwaZulu-Natal advocate Penny Hunt has been suspended from practising as an advocate for six months. This is the punishment determined by high court judges Albert Kruger and Connie Mocumie, who found in a reserved judgment handed down on Tuesday that Hunt was responsible for instructing a surveillance technician, Houston Wayne Impey, to plant a “listening bug” in the ceiling of the advocates’ chambers. They ruled that there was also proof that she caused a tracking device to be put onto the car of fellow advocate Mergen Chetty with whom her husband, Cameron Hunt,SC, had been involved in an altercation. Chetty laid a criminal complaint against Hunt,SC, after being punched at an advocates’ function at the Pietermaritzburg chambers in June 2010. While finding her conduct unprofessional, and saying that she had “not been candid” with the court by denying she was behind these acts, they found there were insufficient grounds to strike her off the roll as applied for by the KZN Society of Advocates. Instead they suspended her from practising for six months. In their judgment judges Kruger and Mocumie (who was recently appointed to the SCA) said they did not get the impression from Impey’s evidence that he had wanted to incriminate Hunt. He had described his actions and dealings with her as he remembered them. Impey had testified that he installed a listening device in the ceiling above the Bar secretary’s office at the request of Penny Hunt. He said he put a receiver on her desk to receive signals and installed a program, Audacity, to be able to hear sounds picked up by the listening device. On a later occasion he had upgraded the software. He also said Penny Hunt paid him R10 000 to install the bug and tracker plus R5 000 on an earlier occasion to “sweep” her office. The judges also said that as far as the listening device was concerned the expert evidence led on Hunt’s behalf, showed that when it was found in the ceiling the device could not successfully transmit audio signals and “could not work”. However, they said the question was not whether or not Hunt had caused a successful listening device to be installed. The question was whether she had requested it be installed. They said while Impey “may not have done a good job” that did not mean that Hunt did not make the request. In their view she had done so. “Impey had no cause to install a listening device off his own bat. The same goes for the tracking device on Chetty’s car,” the judges said. They said if Impey had not told police about it, the tracker may never have been found. They said Hunt had admitted she had wanted to have Chetty followed. They said that by instructing Impey to install the listening device and plant the tracker on Chetty’s car Hunt showed “lack of judgment” and her behaviour fell short of what is expected from an advocate. They added that Hunt was “not candid with the court”. She had been an advocate for just over two years when this all happened. “In her view her husband was being unfairly treated by the Bar Council. Her actions flowed from an incident involving Chetty whom she believed to be a different person to what the Bar Council thought he was … The Bar Council did not want to listen to her. “She knew her husband would not approve of her activities in having tracking and listening devices installed and that is why she did not tell him. She may have realised after giving the instructions to Impey that she made a mistake but by that time she had woven herself into a web she could not escape from. “In our view [her conduct] does not show a flaw in her character justifying striking off,” the judges said. They also said took into account the “non-conciliatory” stance taken by the Pietermaritzburg Bar Council in the matter, its “ antagonistic” attitude and hostility which was illustrated by the role it played in “causing the premature publication of internal matters pertaining to Penny Hunt and its insistence in pursuing a charge of theft of the CCTV hard drive at the advocates’ chambers even after it became clear that there was no substance to that charge”, they said.